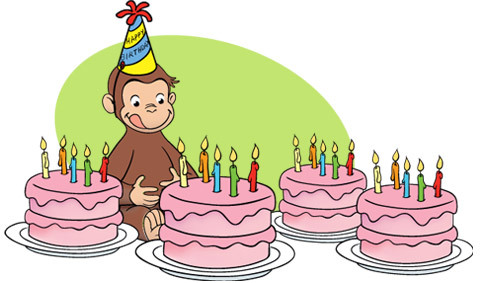 Did you know that everyone’s favorite cartoon monkey, Curious George, is over 75 years old? It’s true! 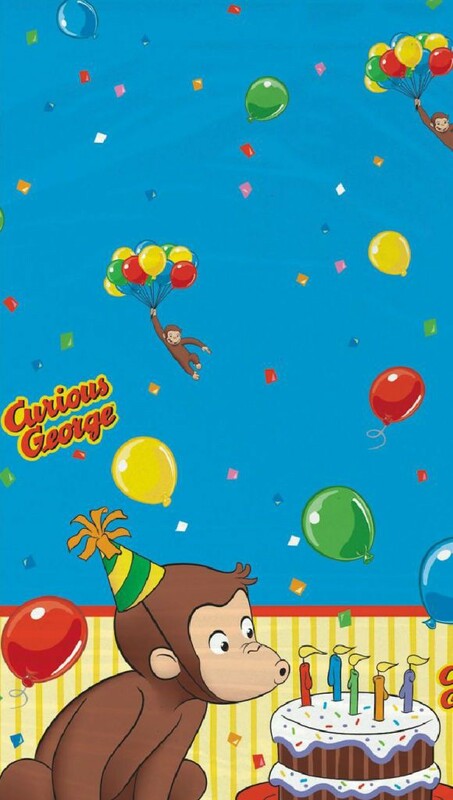 The first Curious George book was published all the way back in 1939. Since then, over the years, Curious George has entertained and educated generations of children. Your son or daughter is probably among them. Actually, you probably grew up with the adorable little primate, and there’s even a chance that your parents and grandparents were Curious George fans! 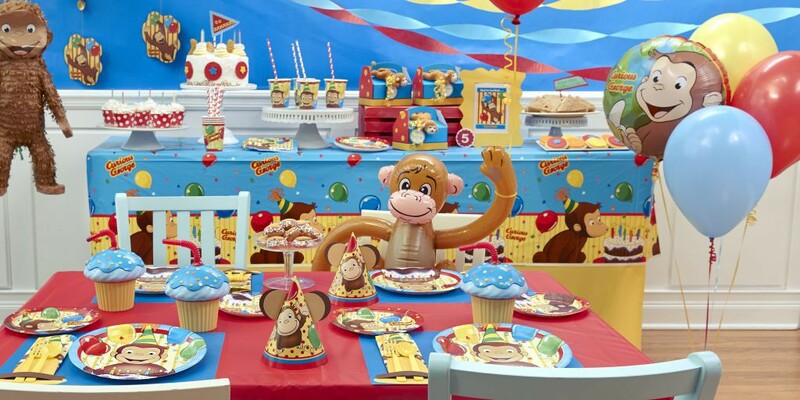 So when you’re coming up with an idea for a birthday bash for children of any age, throw them a Curious George party! We’ve used blue placemats and a bright red tablecover on our dining table to make the colors pop in our party design. 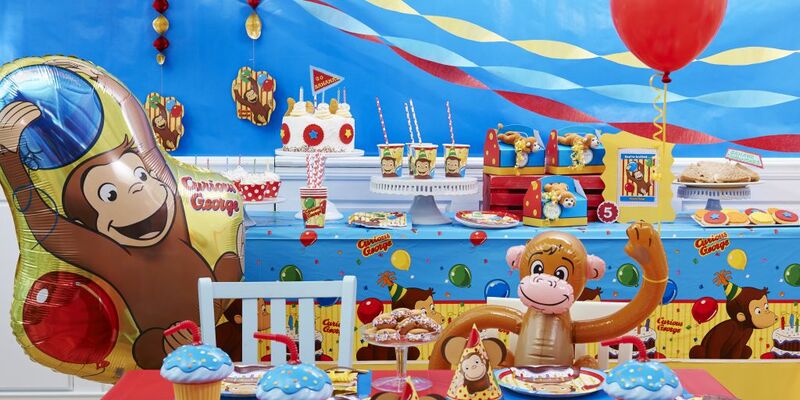 Extra solid color party supplies can be a great addition to any party theme, but we also have a fantastic Curious George tablecover, covered with this darling print. 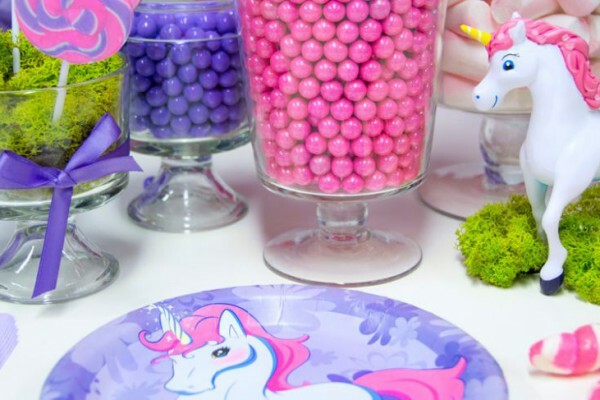 Top your tablecover with plates, napkins, and paper cups. Or you could do what we did, and get these super-cute cupcake keepsake straw cups! Make these Big Yellow Hat napkin and cutlery pockets by cutting shapes from yellow and brown scrapbook paper. Glue them to a placemat, but not entirely. The idea is to leave an opening big enough to insert a folded napkin and a fork and spoon. 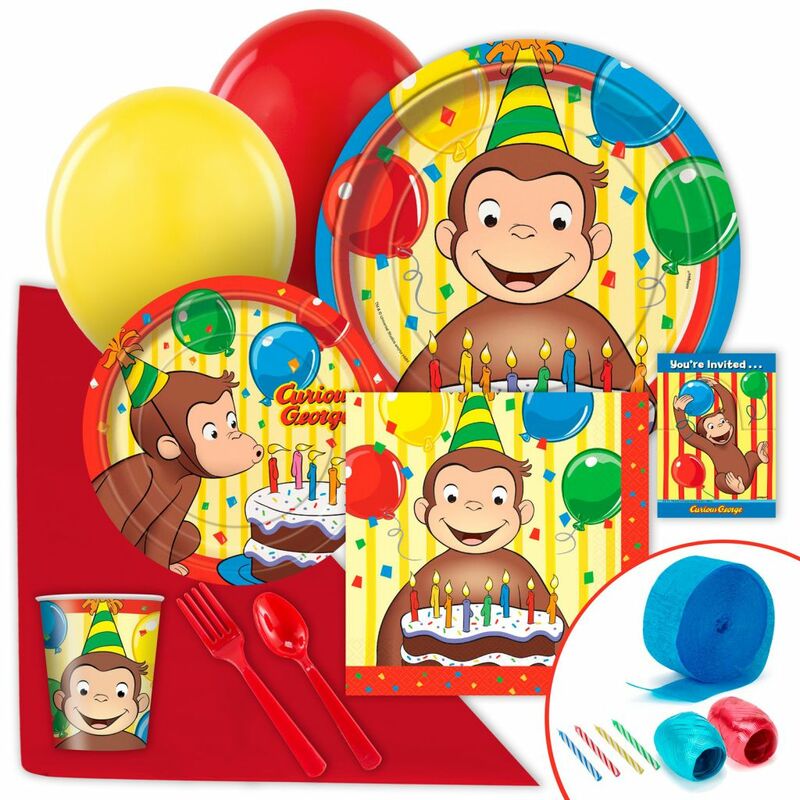 Get everything you see above in our Express Value Curious George Party Pack. 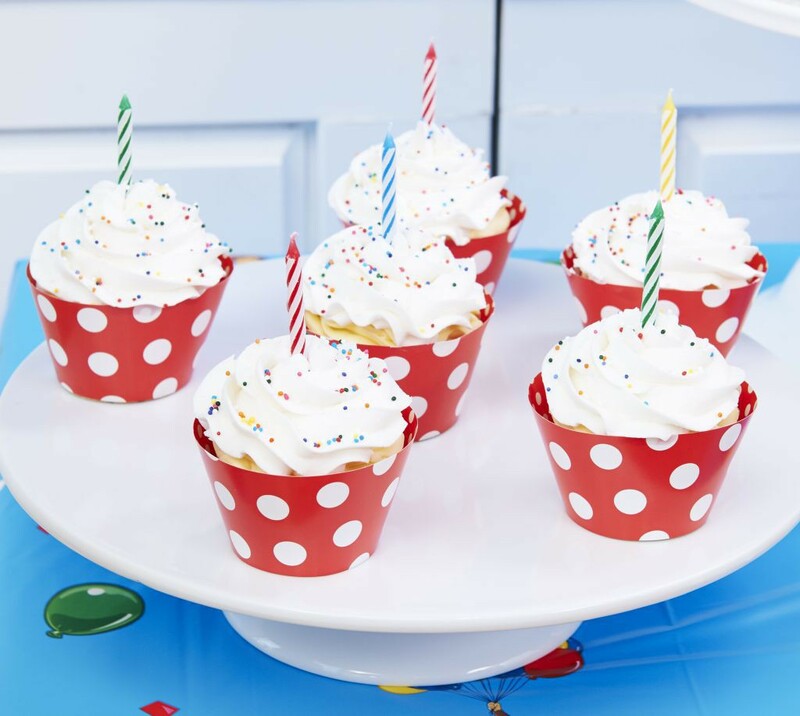 These classic cone party hats are cute enough on their own, but a little DIY touch makes them downright adorable. 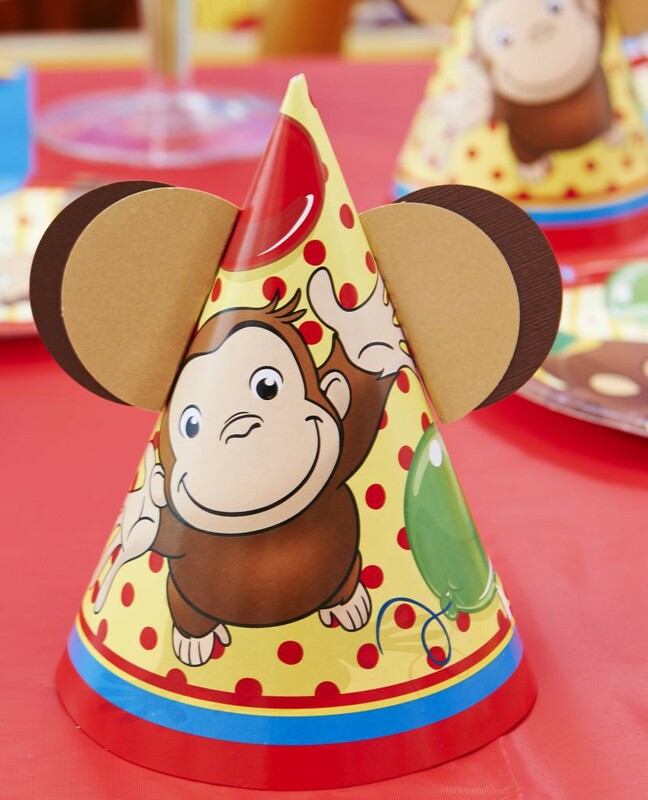 Cut out half circles of brown and tan scrapbook paper, glue them together, and tape them to the party hat, giving all your guests a pair of their very own Monkey Ears! To add a couple more monkeys to the party’s guest list, consider inviting these two adorable apes. 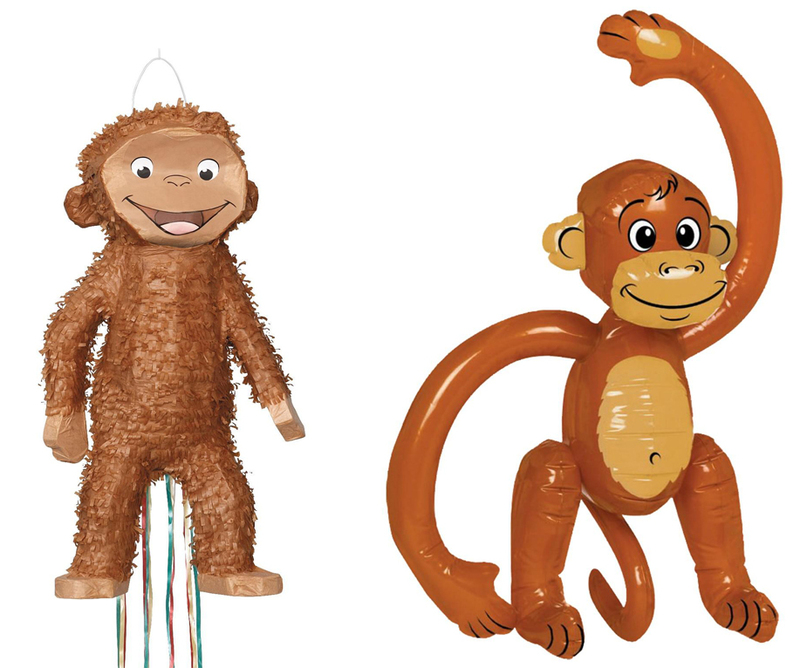 Our Curious George pinata makes for a great decoration as well as a classic party activity, and this cute inflatable monkey will be a huge hit with all the kids. And speaking of cute inflatables, what’s a party without balloons? 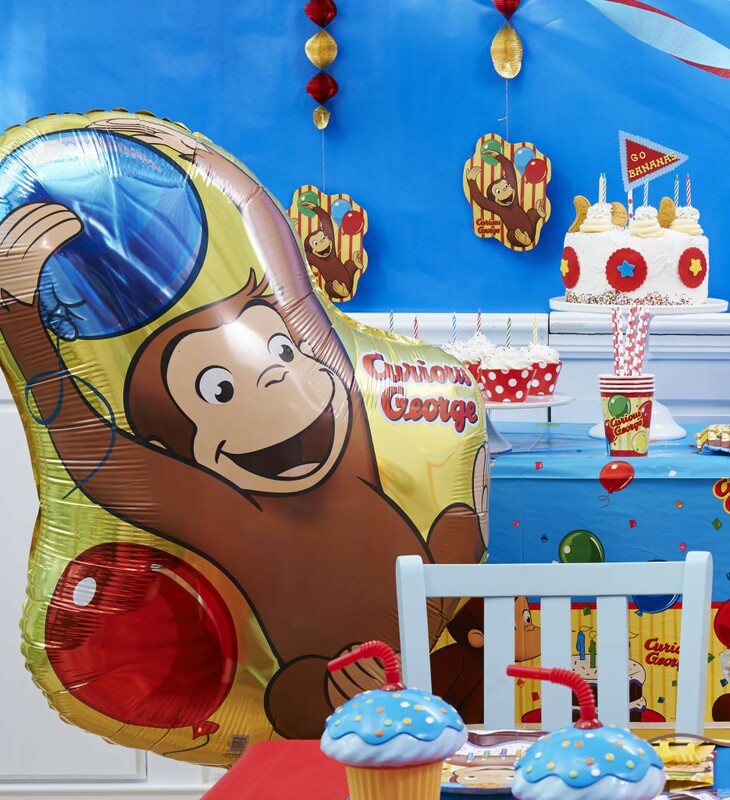 Our beautiful Curious George foil balloon certainly fits the bill, and you can add volume with any color of simple latex balloons. 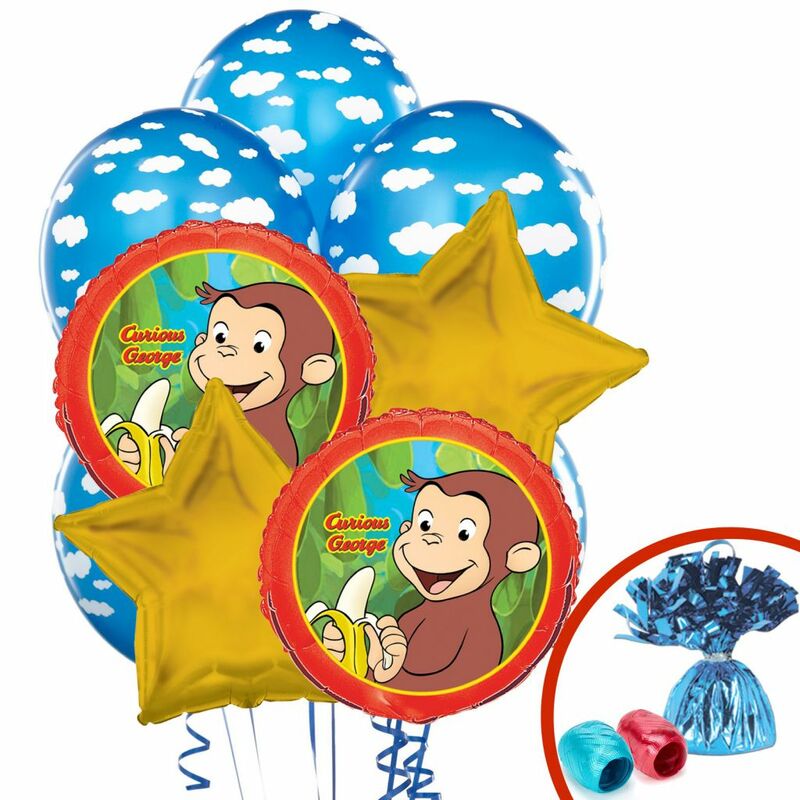 Or you could opt for our Curious George Balloon Bouquet and get everything in one package. We also have a jumbo foil balloon that’s 3-and-a-half feet tall! 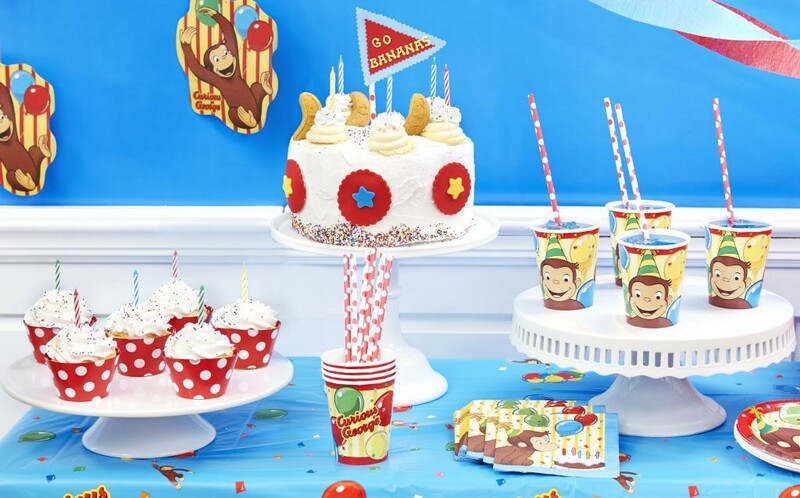 And in the background of that picture, you can see our Curious George Hanging Swirl Decorations, which are great for adding an extra level to your party decor. 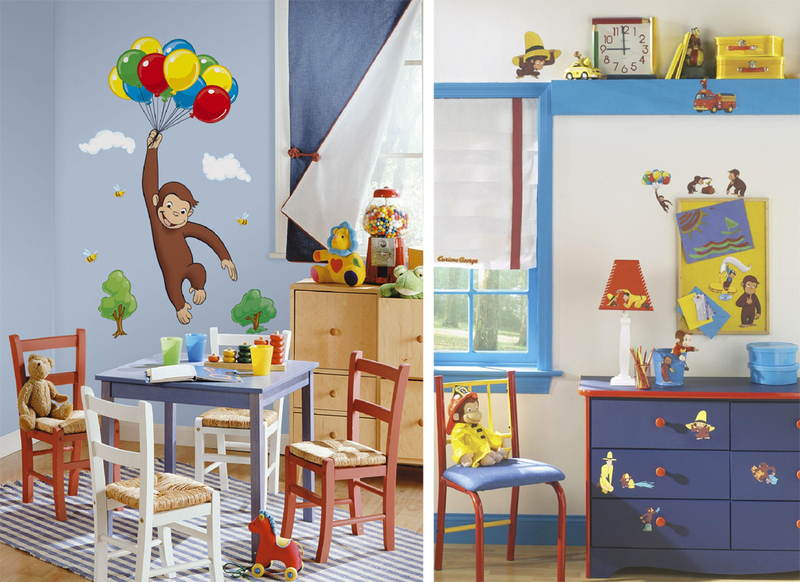 But if you’re looking for something special for your Curious George party decorations, try these Curious George large and small decals. 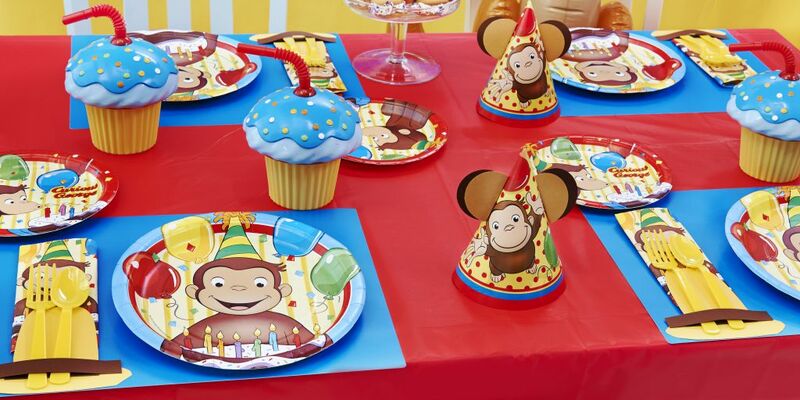 They’re totally removable and reusable, so they can be put up in the birthday boy or girl’s bedroom following the party for Curious George fun all year round. 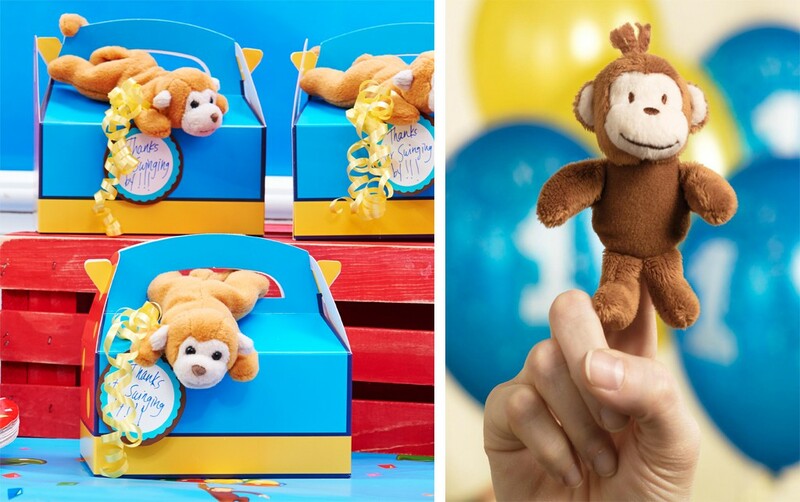 We decided to add a little stuffed friend to our guests’ Curious George party favor boxes for them to take home as a souvenir. Included inside the favor box is an even littler friend, but as you can see, he’s no less adorable! And now we come to everyone’s favorite portion of the festivities: The delicious food and snacks! Try out some of these recipes, or tweak them to add your own flair. We frosted the cake with vanilla icing and used a spatula to help press sprinkles around the bottom of the cake. Then, we mixed light yellow food coloring with the frosting, and piped swirls of banana colored frosting on top of the cake, inserted candles and topped them with more sprinkles. 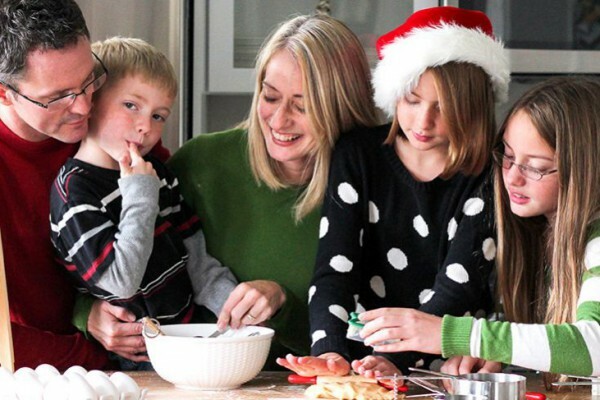 (When in doubt, add more sprinkles!) 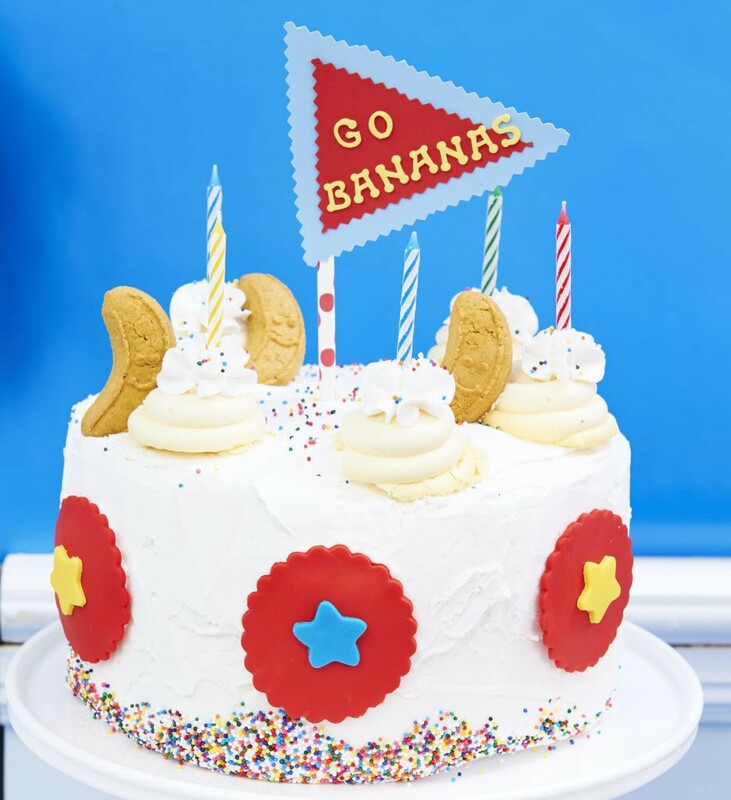 We added banana cookies and a DIY sign to the top, made out of a red polka dot straw, some craft paper cut with squiggly edged scissors, and some scrapbook letter stickers. 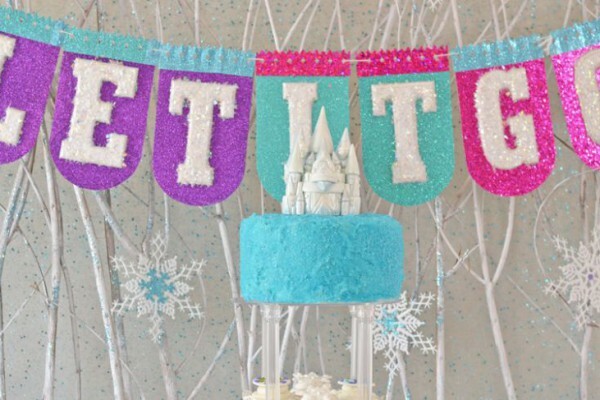 The sides of the cake were decorated using small sheets of fondant from the craft store that we shaped using cookie cutters, and we “glued” them to the cake with more frosting. These sugar cookies are decorated with more of that same fondant, secured with a dollop of frosting. Don’t they look yummy? These are just store bought vanilla cupcakes (with some more added sprinkles! ), but we dressed them up in red polka dot cupake wrappers to make them pop. 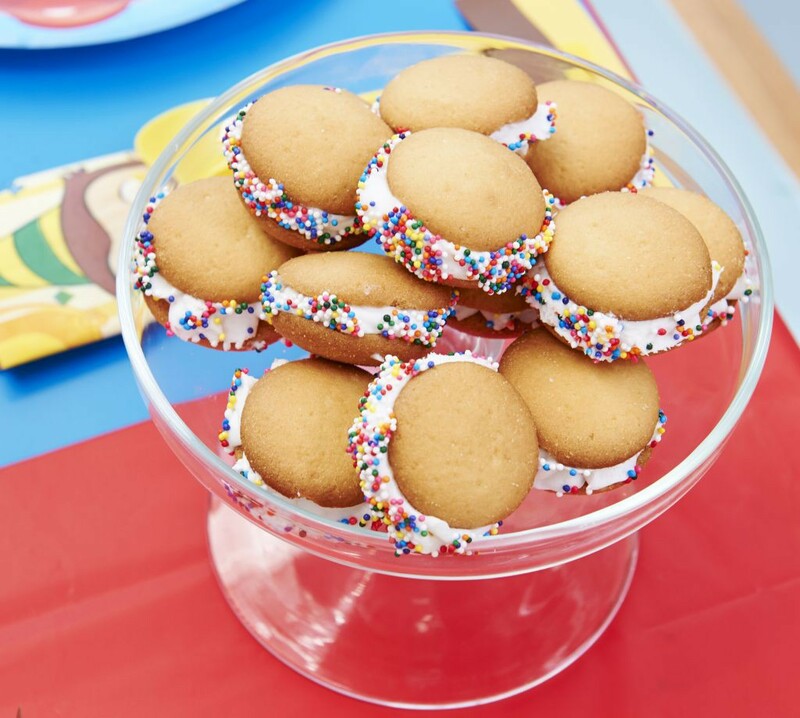 These scrumptious Nilla Wafer cookies are made with vanilla frosting and, of course, sprinkles! 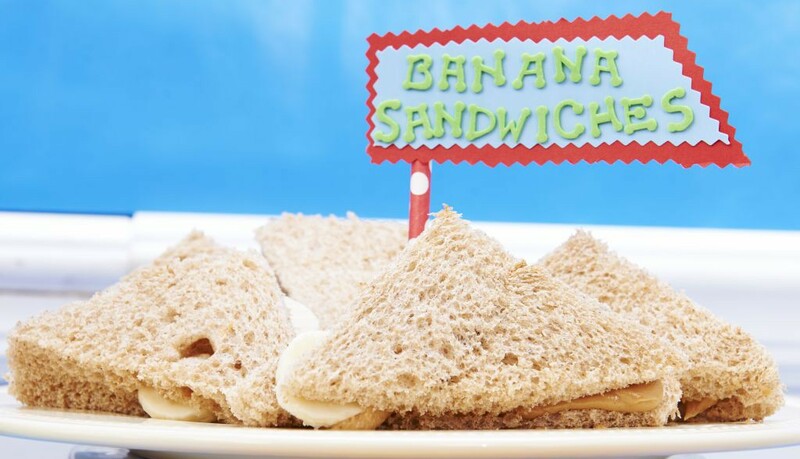 And finally, at a party with a monkey theme, you’ve got to have Peanut Butter and Banana sandwiches! Though you could also use almond butter, Nutella, or honey. The possibilities are as limitless as George’s curiosity! Before we end this post, we’d be remiss if we didn’t mention this utterly adorable Curious George costume! Beware though, your little one might just love it so much, they’ll want to wear it everywhere! 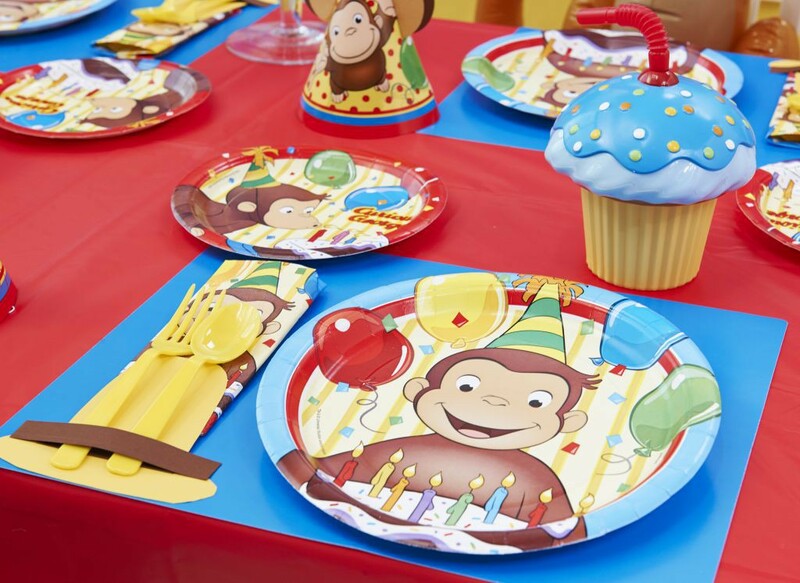 Click here to browse all of the Curious George party supplies available at BirthdayExpress! 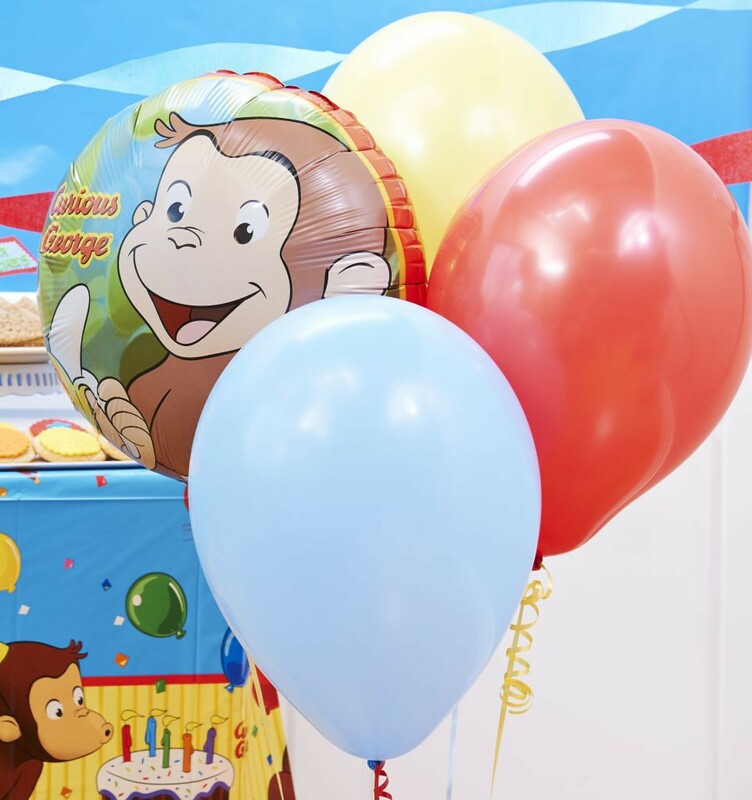 Have we inspired you to throw a Curious George party for your cute little monkey? 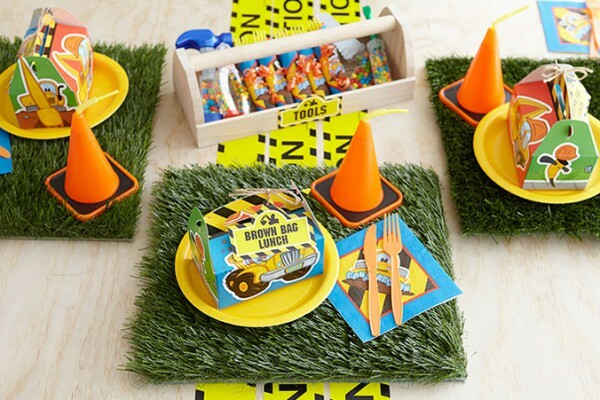 These custom printables match our Construction Pals party. Click here for the free download.